About "NIV Coffee House Bible Espresso/Caramel (Red Letter Edition)"
For many of us, the coffee shop has become our 'third space'---the place we go to share life with our friends and family. It's the place where we meet to discuss things that matter---life, love, politics, religion---and everything in between. 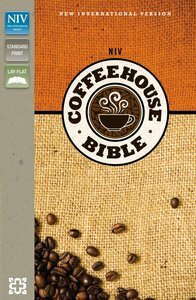 The NIV CoffeeHouse Bible is topically divided into distinct study areas, each allowing you and your friends to consider the place of God and his Word in your life today. Studies on key life issues and important topics will engage your coffee group gatherings for an entire year and get you thinking about things that matter in this hectic world. Each of the 52 studies is broken into sections to fit the amount of time you have. You can use these 'short', 'tall', and 'grande' sections by yourself or with your friends.